Star anise is an evergreen tree native to Asis which grows up to 35 feet in height. The fruits can be eaten fresh or dried. The leaves are poisonous. Traditional Chinese medicine has used star anise plant for centuries for a variety of ailments. In folk remedy, star anise has been used for constipation, breath freshening, joint aches, muscle spasms, sleep and toothaches. 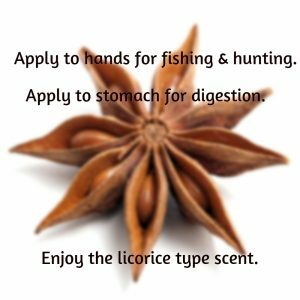 In Asia, anise is chewed after meals as it is thought to promote good digestion and sweeten the breath. It is an ingredient in cough medicines and cough drops in Japan. Documented properties in aromatherapy for anise star essential oil include analgesic, antiseptic, antispasmodic, aperitive, aphrodisiac, calmative, cardiac, carminative, digestive, disinfectant, diuretic (mild), estrogenic, expectorant, insecticide, stimulant (circulatory and digestive system; respiratory tract), stomachic, tonic, warming. Anise star essential oil is used by fishermen and hunters to mask human scent. Blends well with cedarwood, german chamomile, roman chamomile, cypress, fennel, lavender, lime, neroli, nutmeg, orange, peppermint, rose, tea tree and vanilla. Dilute with a carrier oil for direct skin contact. In subtle quantities, it is a wonderful addition to blends, especially with citrus oil blends or as an underpinning to a vanilla blend. If you have sensitive skin, you dilute the oil with a touch more carrier oil before applying. Anise can slow down the reflexes. You should avoid anything that requires full attention. Potentially carcinogenic, based on estragole and safrole content. May cause reproductive hormone modulation and may inhibit blood clotting. Do not use if pregnant, breastfeeding, have endometriosis, have an estrogen-dependent cancer(s). Do not use on children under the age of five.